Schick has released a five-blade trimmer razor that has a built-in bikini trimmer﻿. The product has taken one of the top positions among all the refillable trimmer razors currently available. Most customers have rated it their favorite razor and commented on how easy it was to use over the ankles and knee areas where the skin is thin and often gets nicks and cuts. Most users say it offers a close shave in a single movement and glides smoothly over the skin. The Schick Hydro Silk Trimstyle Razor comes as a double ended razor with an AAA battery slot. The Schick Hydro Silk five razor has been lined with moisture serum dots which are perfect for offering a moisturised and smooth shave on the bikini area, legs and armpits.The gadget also comes with an electric razor that is fitted with a removable and flexible comb. The razor’s removable comb comes with four adjustments so that you are able to control the hair length to be trimmed. This totally depends on one’s personal preferences. It does especially well when it comes to trimming hair very short. One of the TrimstyIe’s downside is its weight. The handle comes with a very nice grip but on using the blade side you can feel the weight on the handle end which makes it a little unbalanced in your hand. This versatile razor has the bonus of offering a waterproof trimmer. This means your Schick Hydro Silk Trimstyle razor can be used in the shower to offer convenient bikini line maintenance. The Schick Hydro Silk razor has enhanced ﻿﻿﻿﻿﻿﻿trimmer technology, so you get the best of both world's, a trimmer and razor in one unit. Changing from the trimmer to the razor is simple and can be done with a flip of the handle. The flexible, adjustable comb which makes up part of this set has four different length settings, so you can choose how short you want to trim the hair to or even trim very short for a cleaner look. You can choose your desired length so that you feel comfortable after trimming. The Schick Hydro Silk Trimstyle razor has five curve sensing blades that ensure a clean, close shave with every stroke. The moisturizing serum is hypoallergenic and tested by dermatologists to offer less irritation after shaving. The serum is water activated and actually assists your skin with replenishing it's natural moisture, which means that your skin stays smooth and moisturised for hours after shaving, even without adding extra moisturiser. The skin gaurds on this razor guard against nicks and cuts, especially on thinner skin areas and reduces overall irritation and razor burn. 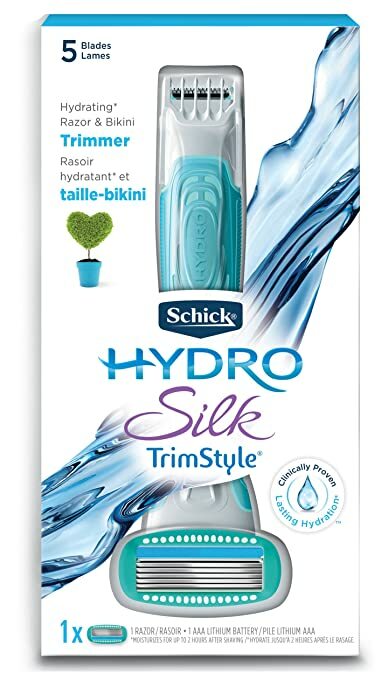 The Schick Hydro Silk Trimstyle Razor puts together the hydrating Hydro Silk razor with a bikini trimmer that has been waterproofed for your legs, armpits and bikini line hair maintenance in one product. The gadget features a razor with five Curve-Sensing blades able to provide a close shave and at the same time reduce skin irritation. With a single handle flip, the whole device transforms into a waterproof trimmer that can be used in and out of the bath or shower for bikini area and all round hair maintenance. The trimmer has been designed to contour to the curves of a woman’s body, to allow for a close shave with less strokes and minimal razor burn. The five Curve-Sensing blades offer exclusive closeness as unique Skin Guards aid in the protection of the skin against irritation and cuts. The moisturizing serum has been medically tested and aids in the replenishment of the skin’s moisture content for up to two hours or more after shaving. The trimmer comes with four flexible comb settings and allows for an ideal trim, especially when maintaining the bikini area. The trimmer has special blades that ensure the skin is not damaged or irritated. Comes with a hypoallergenic, dermatologically tested moisturizing serum for replenishment of moisture and a smoother shave. The gadget is light in weight. The razor itself has curve sensing blades, allowing for close shaves without the skin damage. It is waterproof and thus fit for use in the shower or bathtub. It comes with AAA battery slots, making it portable and does not require an electric connection for use. The handle weight makes it feel a little off balance. One needs to have spare batteries on hand for replacement when the ones in the trimmer lose charge. Although the trimmer comes with sensitive curve blades, the user needs to apply caution on protruding curves or bumpy skin to avoid cuts. The Schick Hydro Silk TrimStyle proves to be an amazing asset to the body hair maintenance arsenal that combines a classic close shave razor with a bikini trimmer. The razor side provides the user with a great shave while the trimmer is able to offer customize trims to longer hair, especially in the ﻿b﻿﻿i﻿﻿kini ﻿﻿﻿area﻿ as it is a slimmer design and does not catch on other areas at the same time. The gadgets compact design and light weight makes it a good travel option as it can slot into a handbag or carry-on luggage easily. Overall the superior design, versatility and ease of use makes this a trimmer most women would be comfortable using.